إذا كنت تبحث عن عقار بموقع جيد في المدينة، فقد وجدت ضالتك في Azure Sea Resort Whitsundays. يسهل الوصول إلى هذا الفندق ذو 4.5 نجوم من المطار، فهو يبعد عنه مسافة 34. Km فقط. يقع هذا الفندق الحديث على مسافة قريبة من المعالم السياحية الشهيرة. يقدم Azure Sea Resort Whitsundays خدمات لا غبار عليها وكل أشكال اللياقة وحسن الضيافة اللازمة لإسعاد ضيوفه. إن خدمة حجز التذاكر, تسجيل وصول/خروج سريع, تخزين الأمتعة, صف السيارات, مرافق للشواء هي جزء فقط من الخدمات التي تميز Azure Sea Resort Whitsundays عن باقي الفنادق في المدينة. بالإضافة لهذا، تتضمن كل غرف الضيوف مجموعة واسعة من وسائل الراحة . بعض الغرف توفر حتى تلفزيون بشاشة مسطحة, اتصال لاسلكي بالإنترنت, غرف لغير المدخنين, مكيف هواء, مكتب لإرضاء أكثر الضيوف تطلبًا. كما أن مجموعة الخدمات الواسعة الموجودة في الفندق لضمان راحتك تترك لك الكثير من الخيارات لقضاء وقتك أثناء فترة إقامتك. يحظى فندق Azure Sea Resort Whitsundays بموقع ممتاز وخدمات يصعب منافستها. Location. Nice unit. Comfortable bed. I like my stay in Azure Sea Grand Mercure apartments. I definitely chose one of the best accomodation in Airlie Beach. The unit is comfortable, neat, clean and very relaxing. I will definitely stay there again next time. The view, the staff and the glorious infinity pool. it was absolutely fantastic and worth the money. Will definitely go there again. It has a great view, the room sizes are quite big and the balcony is big. Our apartment needs some money spent on it to get it back up to scratch. The apartments are individually owned and so you can see where the owners have cut a few corners. We had a box TV in ours! I mean I haven't even seen one in existence in a couple of years so I wouldn't expect to see one here. The toilet had stains that look like they won't ever come out and the tiles are stained as well. Good spot though and the view is nice. We spent 2 nights in an apartment at the Grand Mercure Azure Sea in Airlie Beach. 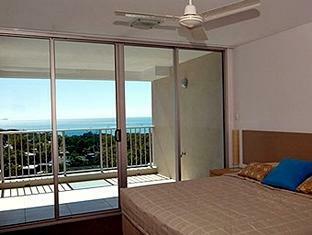 The apartment was very large with a big balcony with a great view over Airlie Beach. 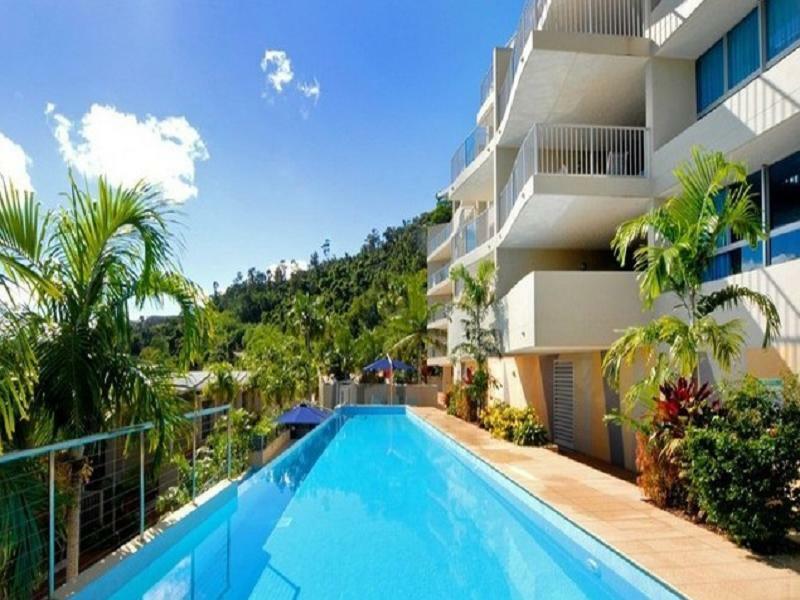 It was convenient for everything in the Airlie Beach area, located on the (quite steep) hill behind Airlie Beach away from backpacker central down below. However, the apartment and its furniture were quite tired and in need of refurbishment and upgrade. We have stayed in Mercure-branded hotels and apartments in Australia and overseas and they have always been of excellent standard, as the Mercure brand is in the middle of the Accor hotel group range. The Azure Sea was satisfactory for a 2 night stay, but not to up Mercure brand standard. The stay was disappointing. Had expected better of Accor hotel group, and with the price, was surprised to find the main bathroom smelling of damp, as if it had suffered from recent flooding. Very comfortable, ideal setting although decor a bit tired. Friendly and welcoming. It was a clean apartment with all the right facilities. Foxtel was a great feature. Die Apartments waren herrlich in jeder Hinsicht. Die grosszuegigen Zimmer lassen viel Raum fuer Erholung, die Aussicht war gigantisch. Sauberkeit wird sehr gross geschrieben. Wunderschoene Pools laden zum entspannen ein.